This has been the worst year ever in the United States for flight delays and cancellations. Planes are full, making it difficult to find a seat on another flight should your flight experience problems. Here are some tips fromAirfarewatchdog.com to help you avoid inconvenience when you're traveling. Avoid connecting flights altogether: They are the flyer's worst enemy. Yes, airlines often charge more for nonstops, but it's worth the extra money. Build longer layovers: If there is no nonstop flight, then build extra time into your itinerary for the connection. Don't take the connecting flight that gives you just 45 minutes to change planes at a busy airport; instead, ask for a two to four-hour layover to make the connection. You may not be able to do this online, but rather you'll have to call a travel agent or the airline directly. Yes, it will cost you more (airlines charge extra to book over the phone, and travel agents charge too) but it's worth it. Hate longer layovers? Bring a good book. You'll hate spending two days on a cot at O'Hare even more, trust me. Shun chronically late flights: Every domestic US flight is assigned a number from 1 to 10, with 1 meaning that the flight is historically on time between 0 and 10 percent of the time, and 10 meaning it is on time between 90 and 100 percent of the time. You can get this data on some airline sites, or call the airline to find it. Some flights are indeed late 100 percent of the time. Try to book only 9s and 10s. Call your airline, frequently: Make sure you reconfirm that your flight is operating on time — or operating at all. Do this several weeks, several days, and several hours before your flight. I've heard so many stories from readers lately about airlines scrapping flights from their schedules entirely (not just canceling one flight, but the entire route or the entire flight schedule) and not notifying passengers until they got to the airport. I wouldn't rely on having the airline contact you, but if you wish, sure, give them your phone number, email address, and mobile phone number. Just don't bet your trip on the expectation that they'll call you. Book the first flight of the day: Just as your doctor or dentist will see you on time if you're the first appointment, first-of-the-day flights tend to be on time as well. Scout alternate flights: Know beforehand what your alternatives are on other airlines if you miss your connection or your initial outbound flight is canceled or delayed. Some airlines will put you on a competitor's next flight out if the "flight irregularity" (as they're called in airline-speak) was within their control (a mechanical problem, for instance). Others won't. If you fly frequently, you might want to carry a printed or PDA copy of the Official Airline Guide (at www.oag.com/) so you can propose alternate flights on the spot. 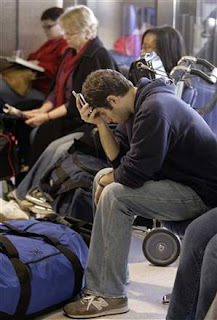 Line up, but call too: If your flight is canceled or delayed, get in line with the other unfortunates, but while waiting call the airline on your mobile phone to make other arrangements. By the time you get to the front of the line at the check in desk all the alternative seats may be booked. Prepare for the worst: If all else fails, make sure that you (and your kids, if any) have books, games, and other distractions in your carry-on luggage. Many airlines sell day passes to their club lounges, a more attractive option than sitting at the gate listening to those awful TV and PA broadcasts. Know your rights: If you are heading out to a wedding or other scheduled event (meeting, funeral, whatever), and you're going to miss it entirely because your outbound flight is canceled or delayed, the airline is required to refund you in full even if you have a non-refundable ticket. You do not have to pay for a now-futile trip.